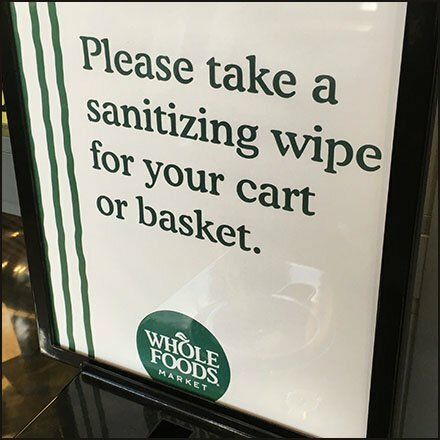 A nice and expected amenity in this day and age, is this Professional Cart Wipe Dispenser At Whole Foods. It is attractive, well-designed, functional, includes a built-in receptacle for used wipes, provides air circulation to the waste bin (see perforated metal grill) and finally is actually branded Professional. What more proof could you ask? Whole Foods piggybacks its branding atop in an invitational sign. This Professional Cart Wipe Dispenser At Whole Foods seen in Allentown, PA. See details of the fixture itself at Sani Professional.